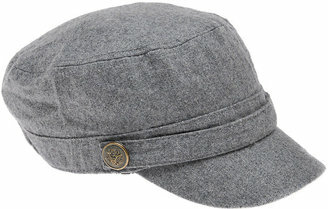 In step with one of fall's top trends, this military style hat by Juicy Couture originally sold for $55 at Bloomingdales.com. The Juicy hat shown at the top of the post is sold out, but you can still get the look with this hat from Aldo, available in either gray or black for just $15. Click the image to purchase. Relief for Dry Winter Skin: What's Your Routine? Neutrogena's Extra Gentle Cleanser leaves skin feeling soft and moist, rather than tight and dry. A couple days ago I found myself watching AccentHealth Waiting Room TV at my doctor's office (just in for a routine check-up), and they did an interesting segment on finding relief for dry winter skin, so I took some notes to share with all of you. Might as well make the most out of a boring situation, right? Jergens Natural Glow facial moisturizer glides on smooth and gradually gives skin a touch of non-streaky color, much like a light coat of foundation. Apply moisturizer to damp skin, right after you shower. Drinking water, while vital for good health, does not relieve dry skin. Use a mild cleanser applied gently with the pads of your fingers. Splash skin to rinse and pat dry. I use Neutrogena Extra Gentle Cleanser in the winter because it's non-comedogenic (like Cetaphil), fragrance free, and won't leave a filmy residue on your skin. Use an oil-free moisturizer for your face. I've been using Jergens Natural Glow Healthy Complexion Daily Facial Moisturizer and I love it. I bought it back in August for our summer vacay to Quebec and have been using it ever since. I use it in addition to the Kiss My Face Olive/Aloe Natural Moisturizer that I wrote about here. Wear sunscreen daily. The Jergens moisturizer contains SPF protection, so I'm covered. How do YOU cope with dry winter skin?